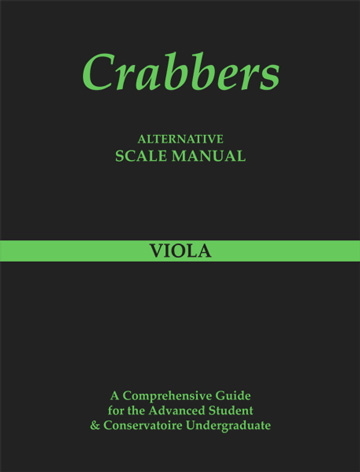 For a description on how to work from the scale manual please go to the violin book. Separate bows Middle - upper half. Use only the elbow with no movement of the upper arm. For tone lean into the first finger on the bow with the weight of your arm. 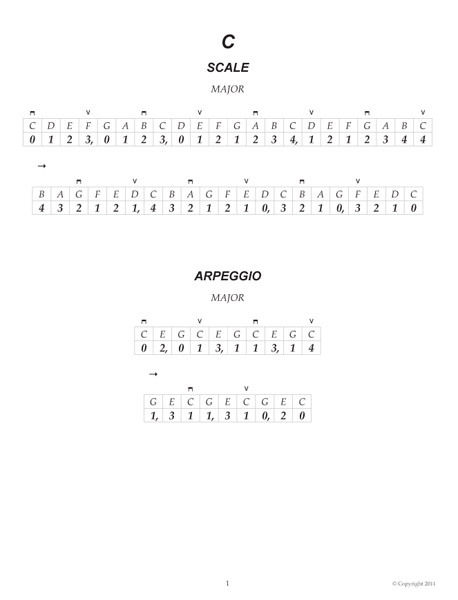 Cover the position changes starting from different places within the scale. Begin with either a or . This will give the correct pulse and finger. This saves time and improves aural awareness. Play with and without vibrato. When using vibrato it is important to keep the movement going between notes. Slur in three's using the & signs as a guide. 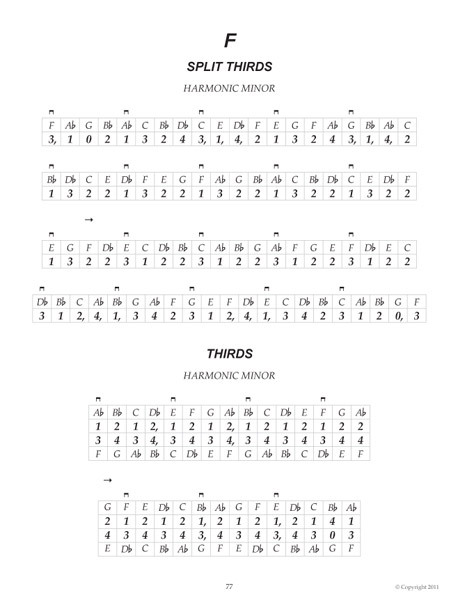 Use dotted rhythms to improve coordination using separate and slurred bowings. Repeat all the above at the heel of the bow. The right shoulder is used for this style of bow stroke. Split thirds in these manuals are the only single note scales that occasionally require a change of string simultaneously. The first line (ascending) 3,1,4 (C,E,Db) is a typical example. These scales are in simple time so the pulse on each down bow. Controlled movement from the right wrist when changing strings simultaneously, will give an even tone and ease of execution. Thirds are the most important double stops to acquire an advanced technique, as they improve balance and strengthen the left hand. To further improve intonation play two bow strokes on the same chord throughout the scale. Slide the fingers lightly and slowly into position making sure that the left thumb is in a comfortable position with each chord. This will ensure that the left hand is perfectly balanced. 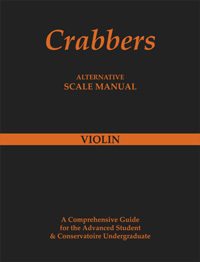 Please go to the violin book for additional information on how to practise 3rds. An explanation giving a broad outline of scales in sixths is covered in the violin pages. Further practise methods is to ghost each part. 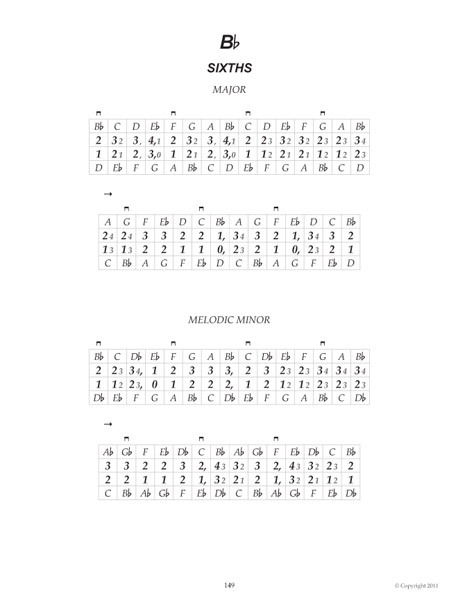 This will improve tone, intonation, fluency and allow freedom of execution. To ghost each part requires only the bow to be drawn across one string at a time. The left hand fingers continue moving together normally. This method of practise is used for all double stop scales.